Food served Mon–Sat noon–10.30pm; Sun 12.30–10.30pm. Sophisticated dining in steak heaven, with great wines and impeccable service. Kyloe manages to feel luxurious and special, without being ostentatious or making more casual diners feel out of place. You can tell that a great deal of effort and thought has been put into creating the most comfortable dining experience possible, from the snug chairs to the attentive staff guiding you from start to finish. Know nothing about steak? No problem: your waiter will bring a board with all the cuts, explain the differences and advise how they should be cooked. All the beef is Scottish and dry-aged for at least 28 days to bring out the flavour. The expected cuts, like ribeye and fillet, are of course present, but there are also sharing cuts like côte de boeuf. There is plenty of choice when it comes to sides too: beef dripping chips are terrific, and the mash with Mull cheddar is heart-warming. Starters are appetising, particularly delicate carpaccio made with Hardiesmill beef which is displayed like fine lace. Wine lovers will be spoilt for choice, particularly when it comes to steak-loving reds. Of course all this quality comes at a price, but this is remarkable food in a lovely atmosphere. Welcome to Edinburgh’s first gourmet steak restaurant. 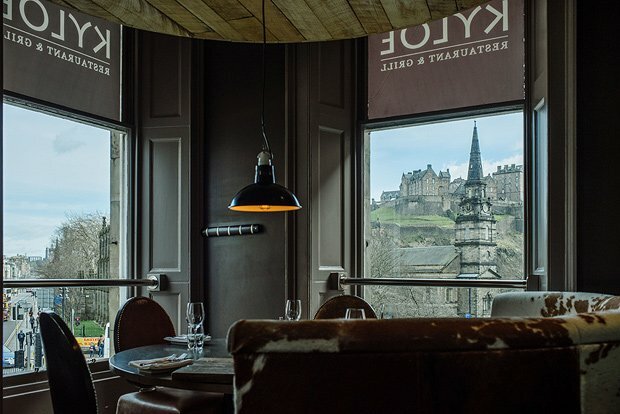 Our first floor restaurant can be found in The Rutland Hotel at Edinburgh’s West End and boasts enviable views of Edinburgh Castle. The name Kyloe, an old Scots word for Highland beef cattle, was chosen for the restaurant as it represents the strength and versatility of Scottish beef produce. We use cuts from pedigree Aberdeen Angus – supplied by some of Scotland’s top farms and butchers – to bring our customers the best possible steak experience. When selecting suppliers, Kyloe’s award winning head chef David Haetzman was not only looking for a fantastic product but for suppliers who take provenance seriously. Hardiesmill, based in Gordon in the Borders, was chosen as one of Kyloe’s main beef suppliers thanks to the owners’ rigorous approach to breeding, feeding and handling. Read more about their fascinating story on their website at www.hardiesmill.co.uk. Using a selection of traditional cuts, along with some more unusual cuts chosen for their texture and flavour, David has created an innovative Grill Menu. This is complemented by our robust a la carte menu which features Scottish seasonal produce, responsibly sourced and simply prepared to create a series of compelling dishes, including a tasty shellfish section and mouth-watering desserts created by our in-house pastry chef Amanda Jordan. Our unique and interesting wine list has been sourced through numerous wine merchants and features Kyloe’s signature wine ‘Angus the Bull’, a South Australian Cabernet Sauvignon which is the ideal complement for your steak. High-end steak restaurants are booming in the capital and the appetite for specialist aged beef served in sleek surroundings shows no sign of being satiated.